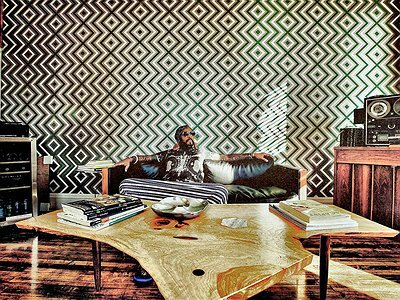 Website / Contact: If you enjoyed this interview with Osunlade, you can find more information about him on the website of his label, Yoruba Records. I started piano at 7 and wrote my first song(s) around age 12. My influences were basically any- and everything popular in the 70's. Being from St Louis, we were fed a hugh fiber diet of funk and soul. Fellow musicians in several bands were influential as well as I studied them on the instruments I didn't play. So I guess I was influenced by almost everything as I am today. Prince from my teenage years on has been the biggest musical influence since. For me, it was emulating others. Again the Minneapolis sound was so huge in the midwest, so all soul musicians were either covering it or writing music that sounded like it. I was no different. However I was an introvert which meant I worked alone and my music was very personal as I was discovering myself. The greatest lessons and development came from early opportunities to produce for major record companies. I was given the space to learn while creating and absorbing on the spot. Musically, I eventually became unhappy with the business and lack of actual music involved, which led me to stop for a while. Upon my return I started my label and had a different idea about life and my music. From then on, its only been about the music I want to hear and make without caring about anything outside of creating honestly. Composition challenges are less of ability on some instruments. To hear it and work through it until it's realized is such a great reward, not only in achievement but growth overall in the instrument. Production challenges are only physcial ones. I travel so much that I'm rarely in the studio these days. But when I am, I manage to lock in and produce more than usual. The space helps. Mood is everything for me. Life is a mood. How you feel at any given second I think should be represented. I have two studios, basically mirrors of each other with different components of sorts. The one in Greece is smaller (only recently) and is all analog. Mostly drums & percussion, but several vintage synths, guitars and basses. The second one is at my mother's in St Louis and has become the main studio as I've expanded. Same set up with drums (less percussion) more synths, wurlitzer, rhodes, piano and vintage drum machines, guitars, basses etc. I have started to incorporate newer pieces of gear like the machine jam and Korg minilogue which are both amazing and have given a boost to the creative process especially for remixes as those sounds are current, whereas programming a moog is clearly a moog. I'm a light freak so the studio is lit with club lights, there's a disco ball as well. So yes, mood is key. I recently finished a new album and used drums, electric piano, moog, percussion, guitar mostly. I live for UAD apollo which has become the most important tool in my studio for post production and processing. My use of contemporary tools are limited but what I utilize definitely expands the possibilities of sound. I spend more time processing and mixing parts than I spend actually creating the music. It's exciting when the end result is a totally new idea you would never have thought of without the technology. Bonus! The new album Fuscia happened in the course of two weeks. I started it in Berlin with two songs, both mellow songs born from the piano available at an airbnb I was renting. They were both love songs as I was contemplating space from my love. The remainder of the album happened at the main studio at mom's. A few track ideas created earlier came to light and lyrics appeared, mostly based on world events, the election etc. The remainder of the album was created with long days and nights just creating non stop. The title Fuscia came as one of the songs entitled. No real concept for the project but the theme over the process evolved into a social, love story or sorts. The sound is funk and the intent was raw class. I wanted to make something rooted in drum, bass, chord, melody. Not many frills and the most important thing was that lyrically, most pieces only have one verse, and it's repeated several times. I wanted to attempt this to see if it becomes a message or a bore. Overall the ideas come for me during the process. It shapes itself as I mostly work until it's complete. Meaning if I have my mind on an album, it's all I do. I stay in the studio round the clock with the exception of a meal here and there. "Mood is everything for me. Life is a mood."